In Store & Online: Sign up to get daily emails from Saks and get a 10% coupon via email valid in store and online. Head on over to saks fifth avenue stores or online, they are having an 80% off clearance sale. Best prices of the year. Coupons not required. 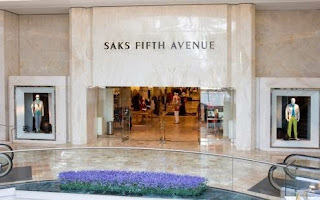 Online: Enter Saks Fifth Avenue coupon code: TIME2SHOP in their promo box at checkout. In Stores & Online: Coupon will not apply on this sale. Save 25% on 1000's of styles. Savings will be applied at the register or at checkout. Not valid at Saks stores in Canada, or at Saks Fifth Avenue stores. Sak's fifth avenue's Friends and family promotion. 25% Off Apparel, Shoes & Accessories, 20% Off Jewelry. Print and present coupon for Buy One, Get One Free offer on Men's Suit of equal or lesser value. Buy One, Get Two Free offer valid on Saks Fifth Avenue Dress Shirts & Ties. Upon return of the item purchased at the ticketed price, the free items will be adjusted to their ticketed price, for which the customer is responsible. Enjoy $20 off your $100 purchase when you present this email in store. Print coupons and enjoy up to 50% off select men's & women's apparel, jewelry and accessories as well as an extra 25% off throughout the rest of the store with your More! Card. Friends and Family in stores and online.. Get 30% off selections of apparel, shoes and accessories plus 20% off jewelry.